Cloudschool.org is a learning management system (LMS) that provides a simple, free way for teachers to plan and deliver lessons online. Teachers can publish lessons, homework, and assignments for students to access on any device – without students needing a log-in. 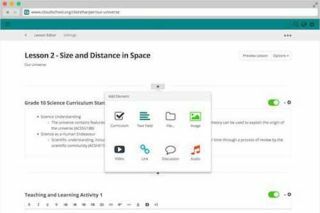 Teachers can use Cloudshool’s simple tools to create dynamic, multimedia-rich courses. Each lesson can be linked to curriculum standard and teachers can reuse or modify lessons. After teachers have created lessons, students can view their teacher’s Teaching Space at Cloudschool.org/your-username. Teachers can password protect lessons and easily control which parts are visible. Cloudschool helps teachers share content with colleagues making it a great tool for schools that encourage collaboration and team planning. Check out this YouTube video to see Cloudschool in action or visit their website for more information!